I'm not a shortbread kind of person unless it's dipped in chocolate! If I'm going to eat dessert calories, I'm not going to waste them on a cookie that I personally think is boring and on the dry side. Shortbread and pecan sandies just aren't my thing. 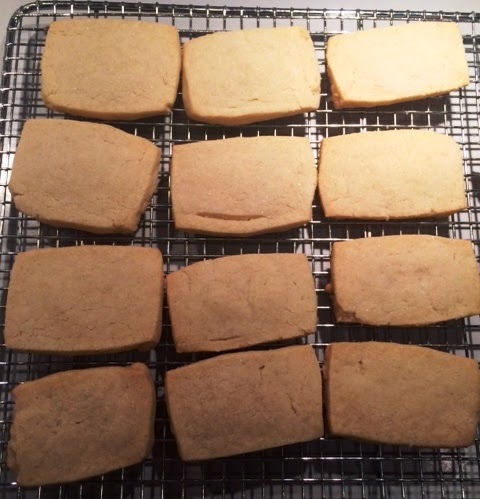 However, I made this recipe for my co-worker who loves shortbread. Thought it was going to be super easy (the ingredients include just butter, sugar, salt vanilla paste, all-purpose flour), but I had issues after making the dough. It says that the dough can be refrigerated for up to 2 days or frozen for up to 1 month. The recipe then says: "Unwrap the dough and place it between 2 pieces of parchment paper or plastic wrap. With a rolling pin, pound the top of the dough, working from left to right, to begin to flatten it, then turn the dough 90 degrees and repeat. (This will help prevent the dough from cracking as it is rolled.) Roll out to a 9-inch square. If the dough has softened, slide it (in the parchment) onto the back of a sheet pan and refrigerate it until it is firm enough to score." Sounds easy enough. But do you know how HARD the dough was? It was like beating a freakin' rock with the rolling pin. Perhaps he should've said to let it soften just a tad to where it's somewhat malleable. Anyhow, I like regular sized cookies, so I made a dozen though the recipe says it produces 2 dozen. My co-worked and people at work raved about the shortbread and asked for the recipe, so I'll take their word for it that it was good!